Desalination plants remove salt and other minerals from saline waters to produce fresh water suitable for human consumption or irrigation. Their technologies fall into three major categories: Multi-Stage Flash (MSF) distillation, Multiple Effect Distillation (MED), and reverse osmosis. Copper alloys are used extensively in the thermal plants: MSF and MED. Copper-nickel alloys C70600 (90-10 Cu-Ni), C71500 (70-30 Cu-Ni) and C71640 (66-30-2-2 Cu-Ni) are used and perform well due to their corrosion resistance under high chloride and temperature conditions. When water flows into a vacuum chamber at a temperature higher than the saturation temperature, evaporation of some of the water will take place instantaneously. This is called flash evaporation and is the principle used for the production of fresh water from sea water. In the Multi-Stage Flash process, evaporation and subsequent condensation to provide the fresh water is divided into many stages. Incoming feed is passed through heat exchanger tubing on the exterior of which water vapour at progressively higher temperatures is condensing. Finally it is passed to a separate heat exchanger-the brine heater- where steam from an external source applies the energy for the process and heats the sea water to the maximum process temperature (up to 120°C), which depends on the type of anti-scalant used. The seawater then passes to the evaporator vessel when pressure is released, causing it to boil or flash. This process is repeated in many stages, the pressure being reduced so that flashing occurs at progressively lower temperatures until the brine temperature approaches that of the seawater when part is rejected from the plant. The condensed vapour is collected and passed down the plant to be removed at the lowest temperature as the product from the plant. In larger plants, the major part of the sea water stream is recirculated through the plant. Some is blown down to waste and fresh seawater added to maintain concentration within acceptable limits from scaling considerations. This recirculating brine because it has been boiled many times is deaerated which has a marked effect on reducing its corrosivity. In most modern large plants, the feed is de-aerated in a separate vessel before adding to the recirculating brine. 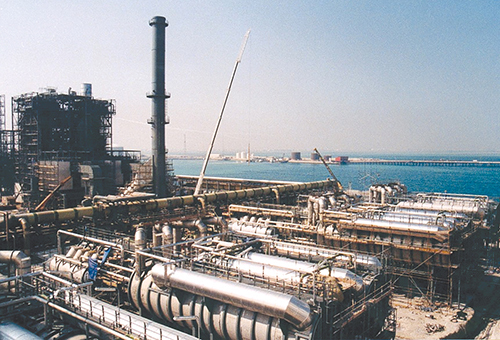 The final stages in the plant are known as the heat rejection stages and are the only ones exposed to aerated sea water. Multistage Flash Desalination is a heat exchange process and although many materials have been promoted for the heat exchanger tubing, copper base alloys are still favoured since they have given good service in these plants. Large quantities of 90-10 Cu-Ni (C 70600) tubing are used as well as 70-30 (C 71500) and the 66-30-2-2 (C 71640) Cu-Nis. The choice of tubing alloy is influenced by the conditions in the section of plant under consideration; the main sections are the Heat Rejection Section, the Heat Recovery Section and the Brine Heater. This is the lowest temperature section and is cooled by natural sea water. In this section corrosion conditions are similar to those in steam condensers and all the factors relevant to alloy selection in such condensers apply. Intake systems incorporate trash racks, band screens etc to prevent debris reaching the tubes. The seawater is normally chlorinated to prevent marine growth. Where sea water is clean and unpolluted aluminium brass has been successfully used. However in plants requiring iron ions to restrict inlet end corrosion, both 90-10 and 66-30-2-2 alloys have become more common; 66-30-2-2 Cu-Ni is often used in large plants for the heat rejection section and 90-10 in smaller plants. This section represents 80-90% of the tubing. The temperature varies from 85-100°C down to 40°C. This section pre-heats re-circulated brine plus makeup feed which are de-aerated; the fluid in the tube being slightly concentrated de-aerated sea water. When boiling occurs in the evaporator stages, dissolved gases particularly carbon dioxide and oxygen are evolved and carried through into the vapour space. Any air leakage in the plant is also drawn into the vapour space. If ammonia and hydrogen sulphide are present in the sea water these are also evolved. The major part of incondensable gases is evolved in the first 3 stages, it is usual to use 70-30 Cu-Ni tubing which has a greater resistance than 90-10 to vapour side corrosion in these stages. In acid dosed plants where carbon dioxide is lower 90-10 Cu-Ni is often used. 90-10 is preferred for the lower stages. Severe vapour side corrosion is most frequently experienced in the vent condensers where incondensable gases removed from the plant are cooled before exhausting to the atmosphere. In these units, the life of Cu-Nis may be short and other alloy systems may be required. Vapour side corrosion of Cu-Ni tubing has also been experienced in the first few stages of the heat recovery section, where the incondensable gases are evolved. Attack has sometimes been sufficient to cause tube penetration. Careful attention to both deaeration and venting arrangements have been successful in avoiding the problem. The preheated de-aerated brine from the recovery section passes to this section where the temperature is raised to 90-115°C. This is the hottest section of the plant and mechanical damage during descaling is more of a problem than corrosion. 70-30 Cu-Ni is the more usual choice, normally with a 1.2mm thickness although some plants use 66-30-2-2. Vapour side corrosion is not a problem in this section even though high concentrations of ammonia from boiler treatment are present. This is because the oxygen content is very low and insufficient to cause measurable corrosion. The 90-10 Cu-Ni alloy is used for evaporator shells in solid or clad to steel and for flash chamber linings. Some large plants use 90-10 clad plate for the main shell. An economic choice for small standard plants is solid 90-10 Cu-Ni with external carbon steel re-inforcements welded to it. The 90-10 clad steel plate (2-3mm Cu-Ni) has become a standard material choice for water boxes. About 40 water boxes are needed in a typical unit. These tend to be used for both raw sea water and de-aerated brine. Aluminium bronze has also given good service although nickel aluminium bronze needs to be used in the heat treated condition to avoid weld heat affected zone cracking. Piping in 90-10 Cu-Ni is widely used in these plants for both natural sea water and de-aerated brine service. Seamless pipe is used up to about 400mm outer diameter whereas large diameters are fabricated from plate. Diameters below 50mm diameter are normally brazed with silver solders. Various materials have been used for tube plates including naval brass, ( which requires cathodic protection to avoid dezincification) aluminium bronzes, solid and clad 90-10 and 70-30 Cu-Nis. The normal method in MSF plants of fitting tubes into tube plate is by roller expansion. The plates are subject to similar corrosion conditions to the tubing but being relatively thick are sometimes made of less expensive alloys. When Cu-Ni tubing is used, 90-10 Cu-Ni is the preferred tube plate material. If 90-10 clad steel plate is used, an adequate layer (8-10mm) of alloy must be provided to achieve a tight connection. Aluminium bronze is less expensive and has higher mechanical properties allowing lower thicknesses. Naval brass is less expensive again but is less corrosion resistant too as it can suffer dezincification which is controlled by fitting iron anodes in the water boxes. Some use has been made of aluminium bronzes both cast and wrought for sea water pumps. They have good resistance to sea water particularly nickel aluminium bronze but can be subject to corrosion attack if the sea water contains sulphides. When fabricated they can be prone to selective phase attack and heat treatment may be necessary to obtain the best performance from nickel aluminium bronze. However, for small plants, pumps in cast nickel aluminium bronze are often used with alloy 400 preferred for the impeller. Pump shafts require a similar resistance to the impeller and also good fatigue strength. The precipitation hardened nickel copper alloy K500 is often used. For brine recycle and blowdown pumps barrel-type or canned pumps are often used. The barrels or cans are usually fabricated from clad steels. The 90-10 Cu-Ni or 316 stainless are used for this. There are two types of MED plants involving thermo-compression distillation (TCD) or mechanical vapour compression (MVD). TCD is the more common. There can be several evaporator stages and a final heat rejection section. Vapour at around 75oC is introduced into the first evaporator. Copper alloys are the principal choice for tubes in the evaporator sections. Here, the top environment is fully aerated but the oxygen level decreases in the lower sections. Copper-nickel is also sometimes used in the final heat recovery exchanger which operates fully aerated. To increase efficiency, it can be necessary to use thin-walled tubes, commonly 0.7mm wall with carefully spaced tube supports to avoid fatigue problems. Water boxes tend to be rubber lined steel, while tube plates can be copper-nickel, naval brass or 316 stainless steel. Further information can be found in: The Corrosion of Copper and its Alloys – A Practical Guide for Engineers, by Roger Francis, Chapter on Corrosion in Waters, p. 343-348; 2009. NACE International. Experience with Copper Alloy Tubing, Waterboxes and Piping in MSF Desalination Plants; by Arthur H. Tuthill, Brian Todd, and Dr. John Oldfield; Proceedings IDA World Congress on Desalination and Water Reuse; Volume I, Sessions 1 to 3; Paper No 73. Vol. III p251; October 6-9, 1997. The Corrosion of Copper and its Alloys – A Practical Guide for Engineers, by Roger Francis, Chapter on Corrosion in Waters, p. 343-348; 2009. NACE International.